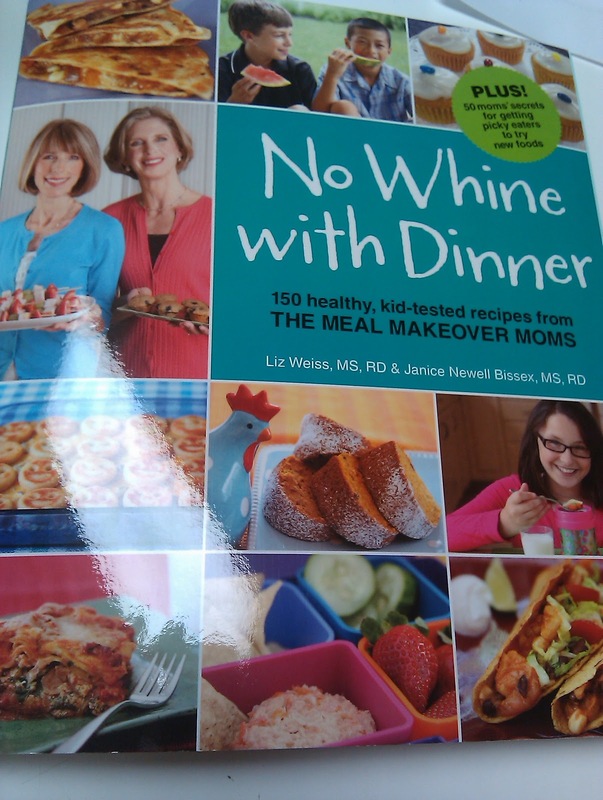 Liz Weiss from Meal Makeover Moms contacted me a long time about her book No Whine with Dinner, which she co-wrote with Janice Newell Bissex. They are moms and registered dieticians who get it. The book came about after they surveyed “600 moms who identified ‘picky eaters who whine and complain’ as the number one obstacle to getting their children to eat healthy, well-balanced meals.” She sent me a copy of her book and I wanted to share it with you. I must have smited the parenting gods by talking openly about my son as a “good eater.” This week has been hard as he is fighting his second cold/flu thingy. He has been refusing everything and we’re hoping it will pass, but I really need this book right now! The Healthy Basics section focuses on nutrition categories and nutritional guidelines as well as a “Pantry Picks” guide on food categories and brands to have in stock at home — I need guidance on both nutritional guidelines and what I should have on hand at home. There’s a lot of all different recipes — recipes for the morning, for packing lunch, for the slow cooker, and even “veggies you don’t have to hide” as well as drinks and smoothies! Included is a section of “bloggers’ best” with recipes contributed by bloggers. Lastly, the authors share 50 “secrets” for getting picky eaters to try new foods. I like it because none of the suggestions involve “hiding” veggies in other foods, which isn’t always bad, but it does have the potential to break trust. Although the authors do add various creative ingredients to recipes, the objective of the cookbook is to get kids to try new foods so that includes showing them what they are eating! Many of the recipes are have few ingredients, which makes it easy to throw together in a pinch as well as assisting those managing food allergies (quick scans for ingredients and easy substitutes). No Whine with Dinner shares recipes for foods that I would eat, but made fun for kids to eat and even to help create. Real food can be made fun enough for kids to eat. Hold the chicken nuggets please! FCC full disclosure: I received one free No Whine with Dinner book to review. I was not given any cash compensation for sharing my opinion on the product. This blog is a personal blog written and edited by me. The views and opinions expressed on this blog are purely mine. If I claim or appear to be an expert on a certain topic or product or service area, I will only endorse products or services that I believe, based on my expertise, are worthy of such endorsement. Any product claim, statistic, quote or other representation about a product or service should be verified with the manufacturer or provider. If your son keeps getting viruses perhaps you should have his vitamin D levels checked. I believe you said previously that you are deficient so it wouldn't be surprising for him to be, also. Vitamin D deficiency can be the cause of getting so many viruses. That book sounds really great! I'm not a fan of the hidden vegetables, not only because of the trust issue but because I think it just reinforces the idea that vegetables are not-kid-food or taste-terrible, etc, so that kids don't even want to try them. And just the names of those recipes are delicious! My kids are food NIGHTMARES–I may have to check this one out, thanks for the review! !